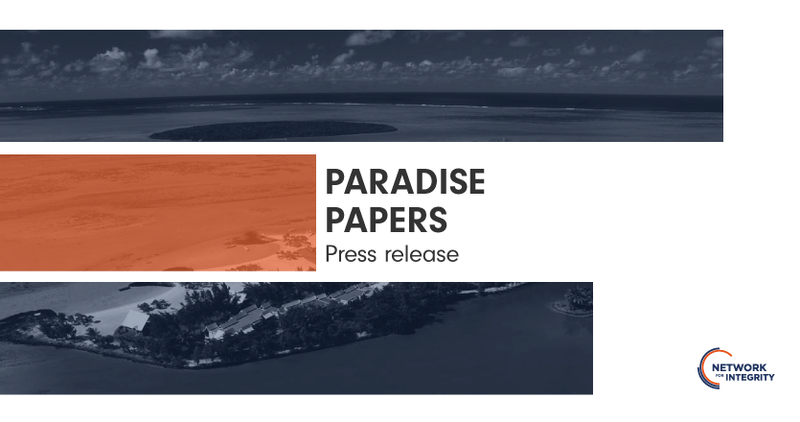 On 5 November 2017, the International Consortium of Investigative Journalists (ICIJ) along with 96 media partners released the “Paradise Papers”, over 13.5 million documents that describe the techniques employed by high-ranking public officials and big companies to evade taxes on over 400 billion dollars around the world. Unlike the “Panama Papers”, which mainly exposed cases of money laundering stemming from tax fraud and illicit activities, the Paradise Papers mostly present legal schemes for tax optimization that exploit the loopholes of the international tax system. This new episode once again demonstrates the transnational nature of the stratagems used by those who want to dodge the rules, whether of taxation or integrity, set by states. Therefore, the Network for Integrity reiterates the growing need to strengthen international cooperation on these matters and encourages the systematic implementation of mechanisms to prevent, detect and sanction breaches of integrity in the public sector. The members of the Network consider that the exchange of information and the sharing of good practices will enable states to eradicate international tax fraud and, eventually, to restore the confidence of citizens in their institutions. The Network for Integrity is an international initiative composed of 13 independent institutions which share missions relating to the promotion of ethics, transparency and integrity in the public sector. Based on the sharing of experiences and technical cooperation, the Network allows its members to discuss freely matters pertaining to their everyday activities and to find in their counterparts the solutions to challenges they face.